A large seizure of cocaine in Guinea-Bissau, the first in over a decade in that country, opens up speculation as to the West African country’s role in the regional drug trade. On 9 March 2019, after a tip-off from the UK’s National Crime Agency, police in Guinea-Bissau seized 789 kilograms of cocaine near Safim, 15 kilometres from the capital, Bissau. The drugs, which had been transported by sea, were placed in 30-kilogram bags and hidden in the false bottom of a truck loaded with fish. It was the largest cocaine bust in the country’s history. But this seizure is extraordinary and notable for a number of other reasons. Firstly, it is Guinea-Bissau’s first seizure of cocaine in more than a decade. The last was in April 2007, when the police seized 635 kilograms of cocaine. The long absence of seizures, combined with the high-profile arrests of several drug kingpins involved in the narco-trade, had led observers to conclude that Guinea-Bissau was no longer being used as a coastal entry point for the onward trafficking of drugs. In interviews conducted by the Global Initiative in Bissau in 2017, the consensus among international law-enforcement bodies seemed to have been that cocaine was still being transited through West Africa – but through neighbouring Guinea or other regional ports. Alternatively, the lack of seizures may have been an inaccurate indicator that masked the extent to which Guinea-Bissau’s archipelago continued to be a thoroughfare for high-value narcotics. As reported by the Global Initiative in March 2018, one UN official interviewed in Bissau had warned that ‘no less than 30 tonnes’ of cocaine had been consistently entering the country every year. Instead, the absence of seizures may well have instead suggested that the drug trade enjoyed high-level protection in the country. 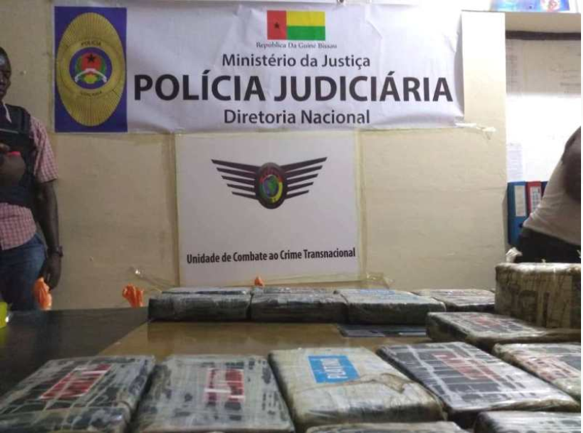 As recently as February 2018, ruling-party leader Domingos Simões Pereira accused the Guinean government of turning a blind eye to drugs entering the country, claiming that President José Mário Vaz was ‘connected to the business of drug trafficking’. What is curious, and what raises a number of questions, therefore, is why this recent large shipment of cocaine was stopped. Could it be the sign of changing winds in the always volatile domestic political landscape of Guinea-Bissau? Or perhaps fruits of more than a decade of internationally sponsored law-enforcement capacity building and cooperation? Or is it that drug trafficking is being (once again) instrumentalized for political gain? The country’s largest ever seizure of cocaine was seemingly conveniently timed just a day before legislative elections in Guinea-Bissau. Within hours, President Vaz announced that the government’s priority would be to combat drug trafficking. Unlike previous cocaine seizures, which in the past have often gone missing – presumed for onward sale – this time the government made the unusual and highly symbolic gesture of burning the cocaine and destroying the cache. This was almost certainly a political message deliberately orchestrated to assure the international community and internal detractors of the state’s renewed efforts. Accordingly, when on 10 March, Guineans went back to the polls, the ruling African Party for the Independence of Guinea and Cape Verde (PAIGC) won 47 of the 102 seats, remaining the largest party. The political deadlock that had paralyzed the country for more than two years, and which has led to the removal of six prime ministers, was potentially broken. Besides what can be inferred about internal politicking, another reason to note this seizure as extraordinary are the actors involved and the onward geographic trajectory they suggest this cargo was to take. Most prominent among the four people arrested for allegedly being involved in the drug bust is Sidi Ahmed Mohamed, a Nigerien originally from Tchintabaraden (halfway between Agadez and Anderamboukane, on the Malian border – a major route used in the trans-Saharan cocaine trade). Bissau-Guinean police are also still looking for two Malians and a Bissau-Guinean ‘army captain’ suspected of being involved in the deal. Our earlier analysis of the evolution of Guinea-Bissau’s drug trade identified interaction between three sets of actors: the Latin American traffickers who source the cocaine, the Guinea-Bissau politico-military elite, who have permitted and protected the trade, and, perhaps most importantly, a set of ‘interlocutors’ – entrepreneurs who use their network to bridge the gap between the elite and the drug traffickers in Latin America, West Africa and Europe. The cast of characters arrested in association with this recent bust reflect this same pattern. 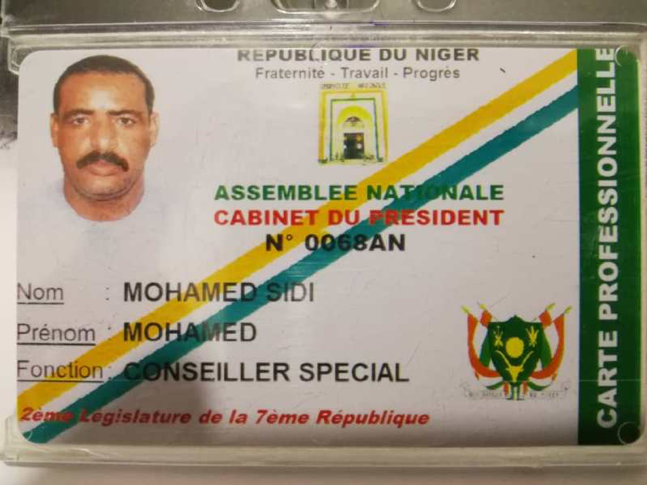 The Nigerien, Sidi Ahmed Mohamed, is a member of the cabinet of Ousseini Tinni, the President of the National Assembly of Niger, and it is worth remembering the hollowing-out of the Malian state that occurred as high-level political interests focused on protecting the cocaine trade. Here we see Mohamed playing the role of ‘interlocutor’ par excellence, the essential mediator linking actors across the region. The suspected involvement of the military captain in this recent event suggests that the Guinea-Bissau military, which has long relied on profits from illicit trafficking, may still be a key player in the drug trade, though it is unclear at present how high up these linkages, which once included the head of the army and the head of the navy, might currently go. The only piece missing is the Latin Americans, but they have long since withdrawn their visible presence from the West African transit trade. The Guinea-Bissau police said that the truck, which had Senegalese licence plates, was on its way to Gao in Mali – an unsurprising location given the city’s record as a hub for the transit of cocaine. Some of northern Mali’s most prominent drug traffickers are based in Gao, where proceeds of drug money have been laundered in newly built villas owned by the profiteers of the cocaine trade. One such neighbourhood, where luxurious properties started emerging in the mid-2000s, even earned the nickname of ‘cocainebougou’, or cocaine town. Cocaine usually transits the Menaka region on the border with Niger before it is transported onwards to Niger’s Tahoua and Tillaberi regions, and thence to the region of Agadez from where it joins the maze of routes leading to the Libyan south. From Libya, the drugs are usually distributed to destination markets in Europe and the Middle East via Egypt. On the face of it, this drug bust goes against the grain of recent known developments in cocaine trafficking in the region. The trans-Sahelian cocaine route is broadly thought to have declined in use over the past years. The wide-ranging presence of French military forces, the proliferation of armed actors vying for control in northern Mali and southern Libya, as well as a surge in banditry in Libya, Niger and north-western Chad – which is also an occasional hub for trafficking of narcotics – are understood to have undermined the reliability of the Saharan routes. Instead of deploying the land routes, most illicit trafficking in the past few years has been conducted by sea. This assessment would seem to be corroborated by drug busts in the Mediterranean, such as the 700-kilogram seizure of cocaine on a Liberian-registered containership transporting frozen meat from Brazil off the coast of Algeria in March 2019, and the record-breaking 10-tonne cocaine seizure in Cape Verde in February. What is also of interest is the claim that al-Qaeda in the Islamic Maghreb (AQIM) was involved in the trade of the seized drugs. The Global Initiative was unable to substantially verify this claim, and hard evidence of AQIM’s participation in the cocaine trade has never been proven. Nevertheless, increased extremist participation in the market cannot be categorically ruled out, and cocaine is considered one of the most lucrative illicit economies in the Sahara. AQIM’s fortunes have been on the wane in the past two years as extremist groups in the Sahel have fragmented and dispersed across a wider territory. The AQ ‘brand’ has lost currency in recent years and AQIM itself is now mostly concentrated in northern Mali. An entry by the group into narcotics trafficking could therefore be a power play to attract an injection of resources. There are many reasons to speculate about what this seizure might indicate, and many reasons to be vigilant to the trend that might be building here. Cocaine production in Colombia hit a record high this year, a factor that may be one of the reasons that greater volumes are being again routed through West Africa. The potent destabilizing and damaging impact of the transit trade has already been seen, and it has left a painful legacy in the region. These could well be the warning signs of its second coming. Alexandre joined the Initiative in October 2017 and is currently an analyst researching migrant smuggling dynamics in the Sahel. He is also doing a PhD in Security and Crime Science at University College London (UCL), funded by the UK’s Engineering & Physical Sciences Research Council (EPSRC). His research focusses on reconstructing and modelling the structure, activities and behaviours of smuggling networks operating in the Niger-Libya corridor. Before joining the Initiative, Alexandre spent two years in Nigeria where he worked for the United Nations Office on Drugs and Crime and the European Union Delegation to Nigeria and ECOWAS in Abuja, as a consultant on political and security matters. He holds an MSc in Countering Organised Crime and Terrorism from UCL (2018) and a BA (Hons) in European Studies from King’s College London (2015).